I have noticed for a while now, that many people refer to filled puff pastry as streudel. I feel the need to put my professor hat on, and tell you that it is called Strudel (without the first 'e'). The confusion may stem from another German word, Streusel, which is a dryish mixture of flour, sugar, and butter, that is crumbled on top of certain cakes before baking. Anyhow, yesterday we had our neighbors Julie and Jody (of Little Dog Orchard) over for dinner, and yes, we had strudel, filled with pork and veggies. It was yummy, as always. 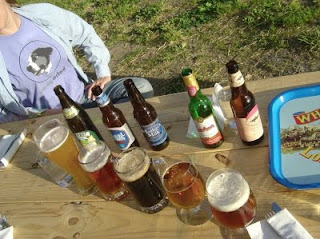 In addition to food, we had them taste through a lineup of beers, which we had taken into consideration for the opening beer menu. Today was almost identical, except the orchard owners were Billiam and René of Liberty View Farm, the strudel contained salmon wrapped in herbs, and the dessert was a beer float inspired by the black forest cake (thanks, Leslie, for putting that bug in our ears ... ;-). Billiam casually brought along friends, a couple and their daughter, and I should have gotten a clue from the stack of edible Hudson Valley, a quarterly magazine about foods in the Hudson Valley, which they had left on our bar, because Helen is its associate publisher. Urgh, real foodies!!! Anyhow, everybody seemed to have a good time, food and drink were well received, especially E! 's chocolate-filled pretzels. So much indeed, that an impromptu naming discussion ensued, finally settling on Schatzi. How many Schatzis would you like for dessert? When I say streudel, I mean streudel- as in something that is dessert like and has a certain kind of topping on it, which is what it is called streudel for. I would never call a pork and veggie pie a streudel or a strudel. I'd call it a pie, pot pie or pasty.